This chapter begins by navigating the terms of the Slow Cinema Debate and then moves to an extensive review of the ways in which commentators theorized slow cinema as an aesthetic, industrial and political phenomenon. As Çağlayan considers slow cinema as a nostalgic rebirth of modernist art film, the second section focuses on global art cinema, with an overview of both the films’ aesthetic features and industrial context. 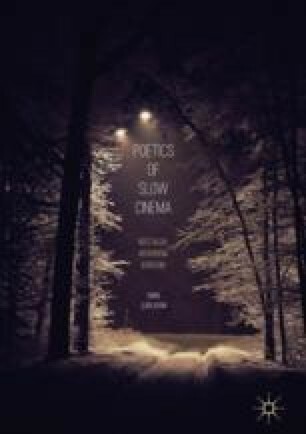 The chapter reasserts the need to consider slow cinema both as an aesthetic and institutional discourse, focusing on slow cinema’s extended use of long takes and dead time as well as its reliance on the networks of international film festivals. In order to explain the critical methodologies employed in the book, Çağlayan summarizes historical poetics as a conceptual framework that considers artworks from an aesthetic and historical perspective. Anon. 2002. Read This Slowly. New York Times, September 28. http://www.nytimes.com/2002/09/28/opinion/read-this-slowly.html. Accessed 5 Nov 2017. Bradshaw, Peter. 2008. The Man from London. Guardian, December 12. http://www.guardian.co.uk/film/2008/dec/12/the-man-from-london-review. Accessed 5 Nov 2017. Dargis, Manohla, and A.O. Scott. 2011. In Defense of Slow and Boring. New York Times, June 3. www.nytimes.com/2011/06/05/movies/films-in-defense-of-slow-and-boring.html. Accessed 31 Oct 2017. Flanagan, Matthew. 2008. Towards an Aesthetic of Slow in Contemporary Cinema. 16:9, 6 (29). http://www.16-9.dk/2008-11/side11_inenglish.htm. Accessed 25 May 2018. ———. 2012. Twilight Zone: Shadows and Fog in the In-between World of Théo Court’s Ocaso. Museum of Moving Image Website, January 11. http://www.movingimagesource.us/articles/twilight-zone-20120111. Accessed 5 Nov 2017. Kois, Dan. 2011. Eating Your Cultural Vegetables. New York Times, April 29. http://www.nytimes.com/2011/05/01/magazine/mag-01Riff-t.html?_r=0. Accessed 26 Oct 2017. Rizov, Vadim. 2010. Slow Cinema Backlash. IFC.com, May 12. http://www.ifc.com/fix/2010/05/slow-cinema-backlash. Accessed 5 Nov 2017. Shaviro, Steven. 2010. Slow Cinema Vs Fast Films. The Pinocchio Theory, May 12. http://www.shaviro.com/Blog/?p=891. Accessed 5 Nov 2017. Slow Science Manifesto. 2010. http://www.slow-science.org/. Accessed 5 Nov 2017. Tuttle, Harry. 2010a. Slow Films, Easy Life (Sight&Sound). Unspoken Cinema, May 12. http://unspokencinema.blogspot.co.uk/2010/05/slow-films-easy-life-sight.html. Accessed 5 Nov 2017. ———. 2010b. Slower or Contemplative? Unspoken Cinema, March 17. http://unspokencinema.blogspot.co.uk/2010/03/slower-or-contemplative.html. Accessed 5 Nov 2017.